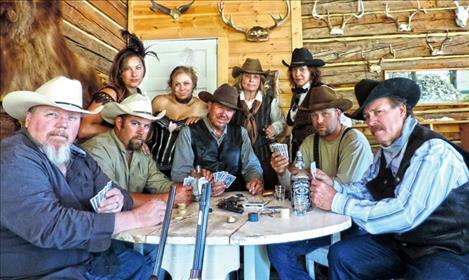 Courtesy photo Dayton Daze will celebrate Outlaws and Gunslingers at the Sept. 12 event. DAYTON — It’s back to the Wild West for the 24th annual Dayton Daze celebration Sept. 12 in Dayton, where the theme for this year’s event is Outlaws and Gunslingers. The fundraising event supports the Chief Cliff Volunteer Fire Department and Quick Response Unit. Festivities take place at the Dayton Park. There’ll be a parade with prizes for best entries and best costumes, catered barbecued chicken and pulled pork, live music by the Classique Cats, a rifle raffle with more than 50 other prizes, a silent auction, an open car show starting at 10 a.m., kids’ games, craft booths, and no end of fun. The entire community gets involved in this fundraiser, including the Dayton Church, Mission Mountain Winery and Dayton Yacht Club. Thanks to the dedication of volunteers, and financial support from our extended community during Dayton Daze last year, the Chief Cliff Volunteer Fire Department has been able to add a Quick Response Unit to the department, providing emergency medical services to the area. So get out your boots and cowboy hat, tie a bandanna around your neck and channel your inner outlaw. Or better yet, saddle your horse — or tune up the Model T— and be part of the parade. This is the costume party of the summer and a great opportunity to support our local emergency services and meet our EMTs. (You never know when you might need them). It’s good wholesome fun for the entire family and benefits a great cause. For more information, call Zoe at 406-849-5917, or search for Dayton Daze on Facebook.